What is a Dodge Ram? This is a big, powerful and brutal car, where you can drive around the city and in the countryside. Until 2011, the brand belonged to the Dodge brand. Now it is a separate division of Ram Trucks (still owned by Chrysler). The first cars of this brand came off the assembly line in the already distant 1981, and became so popular that they experienced several “reincarnations”. Сама маркировка моделей зависит исключительно от параметров их грузоподъёмности. К примеру, если машина называется Dodge Ram 1500, это означает, что машина рассчитана на 1,5 тыс. фунтов груза. Каждое следующее поколение (2500, 3500) – больше и способно перевозить более тяжёлые и габаритные грузы. То есть, на машине с маркировкой 1500 можно перевезти примерно 680 кг, на Рам 2500 – уже более тонны, а на 3500 – 1,36 тонны. Выпускаются также машины с маркировкой 4500 и 5500, но они считаются грузовыми. Since 1972, TM Dodge plants have produced D-Series pickups. In the 80s of the last century, they held a facelift, as a result of which the head optics increased, a new instrument panel and chairs appeared. The interior has changed beyond recognition, but the exterior is only partially. For this car used engines from 3.7 to 5.9 liters. All engines could be equipped with different types of carburetors. The most serious changes occurred in the early nineties, when the 2nd generation Dodge Ram 1500/2500/3500 appeared on the market. While many pickups became more and more like a regular city car, on the contrary, this model acquired the features of a truck. This was due to the fact that the manufacturer studied the opinion of buyers. As a result, the dimensions increased, the famous large grille appeared. All this perfectly complemented the image of the new car. Over time, the performance of the Dodge 1500 was also improved, and by the appearance of the 3rd generation, the engines were revised, and by 2008 they began to put 4.7 liters. unit for 313 hp Machines of this model were made with a full-hard plug or with rear-wheel drive. Also in 2008, the 4th generation was shown at the Detroit Auto Show. As experts noted, the appearance of this car showed the world the fact that a large pickup truck, according to its purpose, can be used for everyday needs, and can be used along with ordinary off-road vehicles, crossovers, etc. 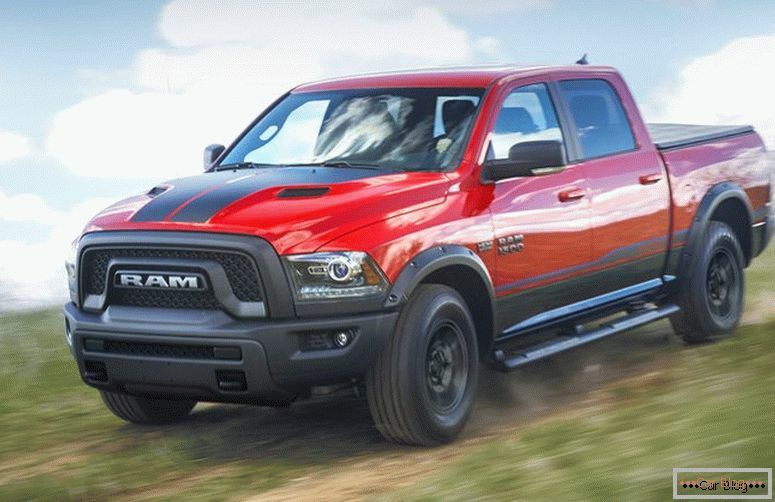 Has the performance of the Dodge Ram 4 generation, relatively earlier version? In general, yes. For example, greatly reworked suspension, added block stability. The interior has improved the quality of plastic, changed some devices on the panel, improved its lighting. Comfortable luggage niches appeared in the rear wings. The design has also changed for the better. In 2009, the 1500th series was slightly updated. The word RAM stands for ram. And this car is 100% worth its name. The machine pleases with its power, endurance, reliability. It can easily withstand huge loads, from which even the Hummer would break after six months of use. 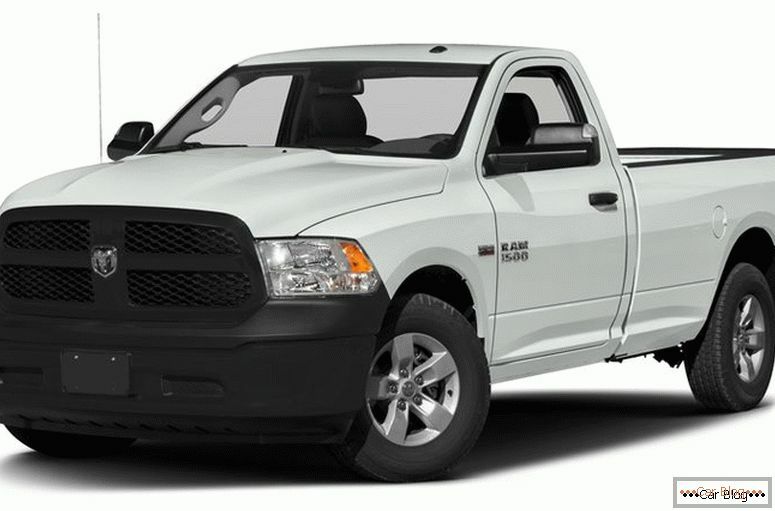 4-ka was produced from 2008 to 2011, when Dodge lost the rights to the Ram brand, and all Dodge Ram 1500 began to be produced under the name RAM. However, all permutations occurred inside the Chrysler parent company, which owns the sub-brands Fodge and RAM. The most modern version was introduced in 2016. This is a large full-size pickup, offered with a standard, or with an extended four-door cab. The loading platform itself can be 193, or 244 cm. Recommended article: The new Porsche Panamera can now drive without gasoline. In an enlarged cabin can easily fit six adult men of standard build. 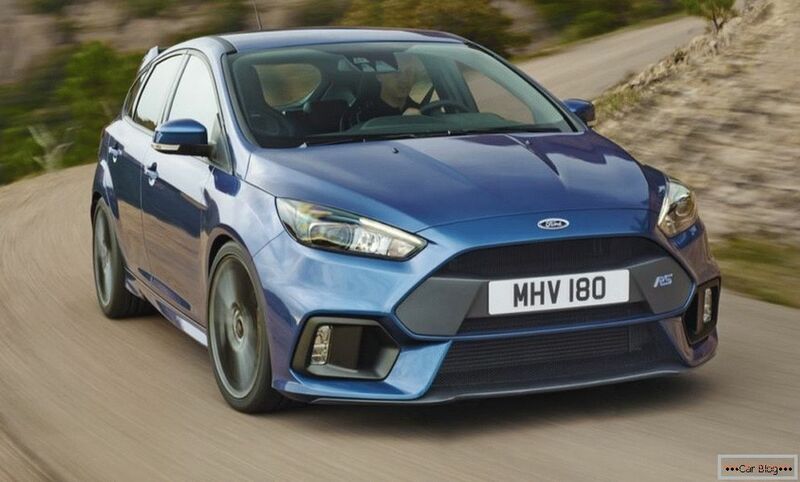 The manufacturer did not stint and offered to buyers immediately eleven options for completing the car, including the popular Rebel, Sport and Limited. Ram Rebel - uprising cars, or evolution? The panel has the ability to connect gadgets. Yes, your smartphone, or tablet can be connected to the car. The luggage compartment has received practical and beautiful lighting on high-power LEDs. Optionally available folding roof. 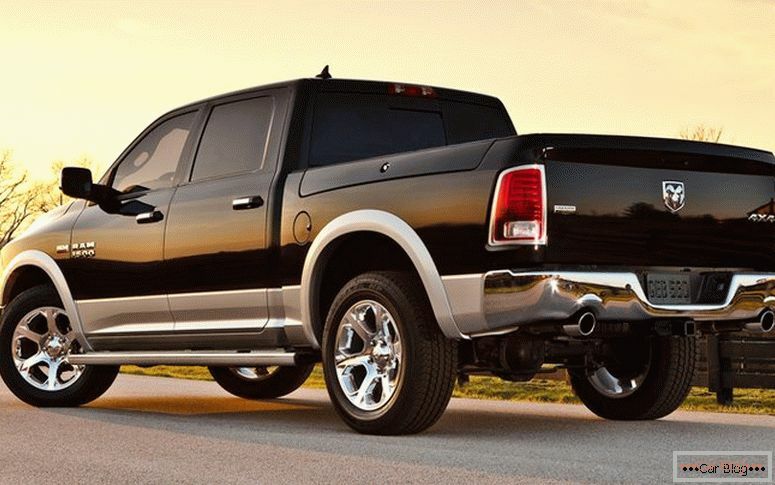 However, no less impressive are the technical characteristics of the Dodge Ram 1500 Rebel. Back in 2015, new cars were shown to visitors at the Detroit auto show. They are equipped with a V-shaped "six" 3.6 liters, with a capacity of 309 liters. with. at 365 N * m, or a similar design with an 8-cylinder aggregate 5.7 liters per 400 l. with. 556 N * m. Both options have a full drive on all four wheels and an excellent 8-speed automatic transmission. V-8 - 4.7 liters 310 l. with. 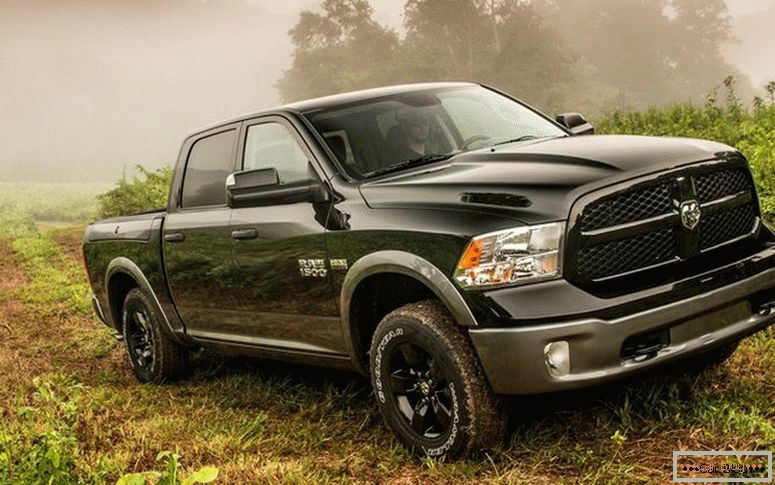 If you are a fan of diesel units, you can find a RAM 1500 c engine "Eco-diesel" at 240 liters. with. This is a decent V-6, with a volume of 3 liters. Not bad technical characteristics of the Dodge Ram 1500 with a Pentastar petrol unit. V-shaped “six” with a volume of 3.6 liters, it has an actual capacity of 305 liters. with. If in the USA this car is a cult, then it falls outside the North American continent only in small batches. Take, for example, the 2012 RAM Pickup sales statistics. Total sales - 360,997 cars. Of these, 293363 cars were sold in the USA, and 67.634 in Canada. A simple arithmetic shows that, outside these two countries, machines, if they did, fell, not directly. Of course, this does not mean that in Russia there is not a single car of this model. For the sake of interest, we drove the name into the search, and found the car of the year 2012 for the first 2.45 million rubles. The seller from Moscow offers a four-wheel drive pickup with a mileage of 120 thousand. Km. This sample has a gasoline unit with a volume of 5.7 liters and a capacity of 396 liters. with. It is equipped with an automatic transmission. 2006, 115 thousand km., 5.9 l. / Manual transmission / four-wheel drive - 2.05 million rubles. If you go to the sites of dealers, you can find the price of new cars. 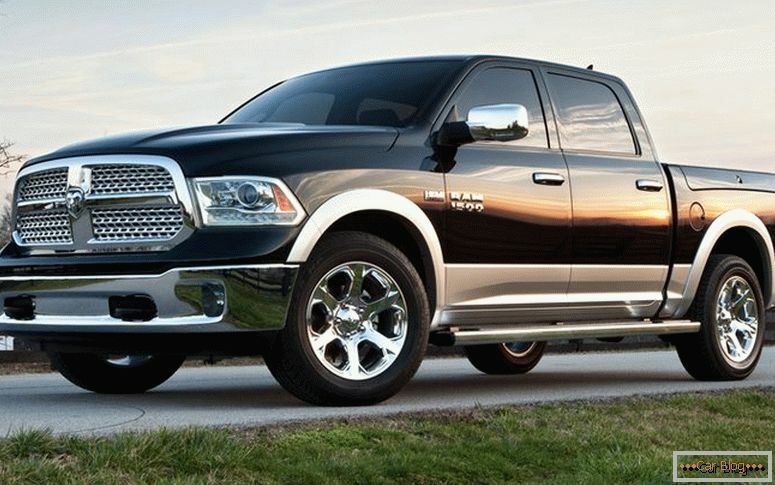 For example, the Ram 1500 Rebel mentioned above costs an average of $ 66500. This is 3.75 million rubles. What do you get for this money? A car that can equally vigorously drive along a country road, through a forest, cross ford water bodies. 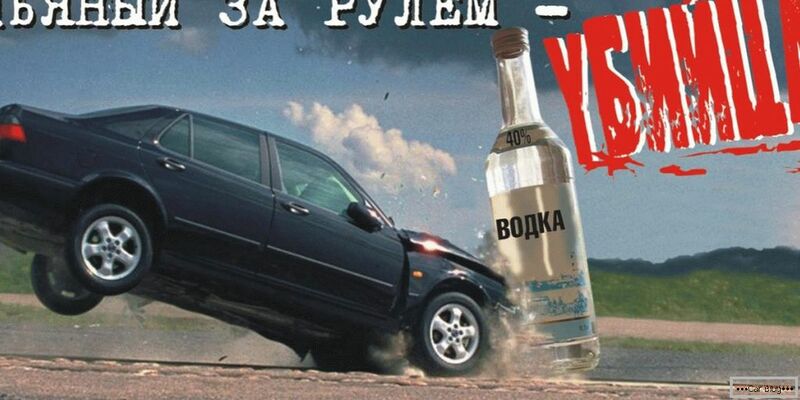 Liftovannaya air suspension (lift 2 ") - a good answer to the Russian roads in the most severe of its manifestations. In the configuration that came to us on the dealer website, the car was completed with a HEMI engine of 5.7 liters. This powerful V8 was designed specifically for installation for Chrysler, Dodge / RAM and Jeep cars in 2009. Since then, it has been refined several times. 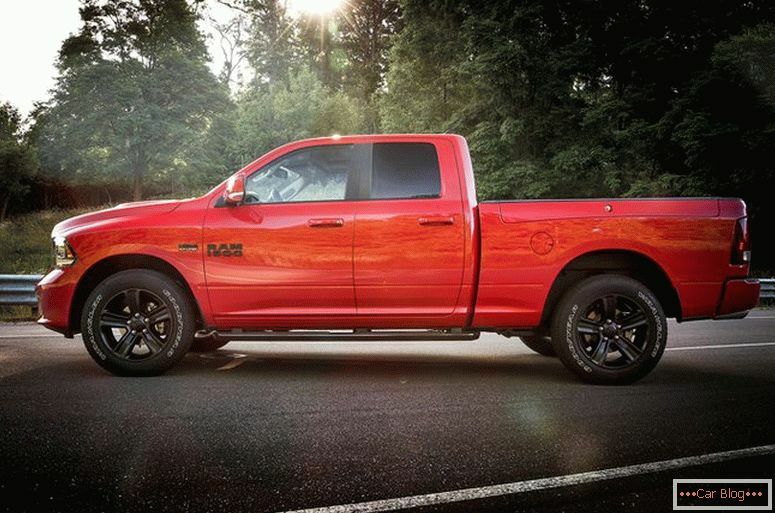 The most stylish in the series, in our subjective opinion - RAM 1500 Crew Cab SPORT. The starting price in the standard version is the same as that of the Rebel. We managed to find in b. y car offers 2017 with a mileage of a little more than 30 km. The owner asks for her 56.6 thousand euros. 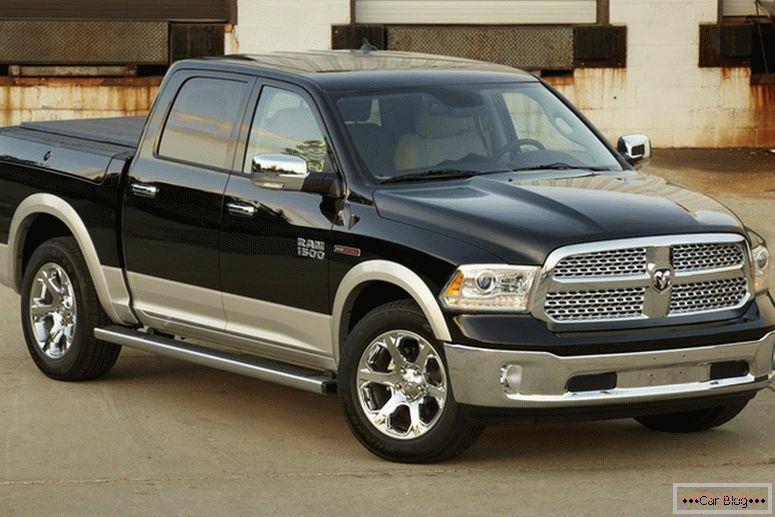 What are the technical characteristics of the Dodge Ram 1500 Crew Cab SPORT? This is a four-door five-seater pickup with a lifting capacity of 640 kg. Empty mass of the car - 2,85 tons. Installed reliable disc brakes. Installed gasoline engine 5.7 liters. has a capacity of 396 liters. with. The fuel tank has a volume of 100 liters. If on the highway the car consumes a modest 10 to 11 liters of gasoline every 100 km, then in the city the consumption reaches 18 liters. In mixed mode, it takes a little more than 14 liters per 100 kilometers. All-wheel drive here is implemented perfectly. In the conditions of the Russian winter and in the mud the car shows itself perfectly. The pickup looks very nice and can compete on the exterior with many modern SUVs. 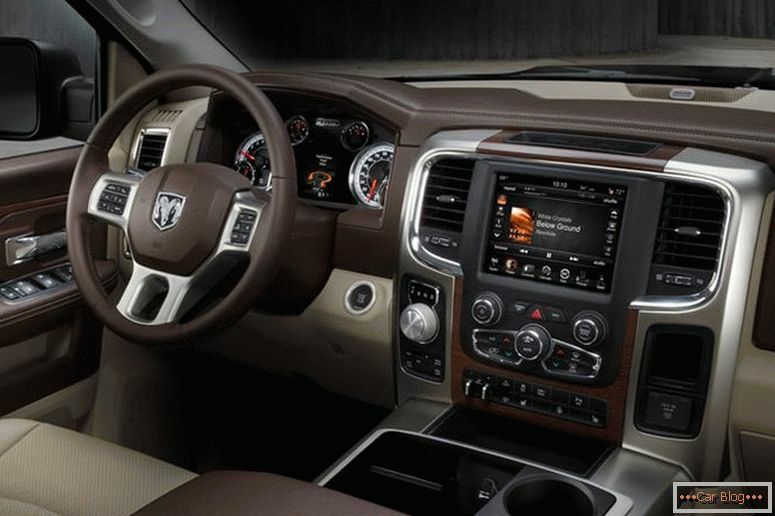 If the classic from Rover seems to you too hackneyed, but you want comfort, choose the Ram in the Laramie configuration. One glance at this car is enough to understand - before you is a real business class. At the same time, our beloved brutality has been fully preserved. The "iron" part is the same - four-wheel drive, 8-speed automatic transmission ZF and a HEMI gasoline engine of 5.7 liters. Optionally available modification with excellent air suspension. So, what's in the cabin? The first thing you should pay attention - a huge number of adjustments. And this is not only the seats, but also the pedals. How many times have you had such that you got into a great car and understood that “gas”, “brake” and clutch are located damn inconvenient? In the new Ram this problem is not. Chairs upholstered in quality leather, ventilated and heated. So neither soprot nor freeze you on the road is not threatened. As it is relevant in Russia, no need to tell. In the States, you can find used items for 33.4 thousand dollars, but the delivery and customs clearance of the car makes its purchase outside of Russia senseless. Let's see what is in this configuration? rear seat armrest, front armrest with 3 cup holders, front center armrest with memory position. When a car costs about 4 million rubles, it's nice to know that you pay money not just for a popular brand. What are the competitors for the RAM 1500? 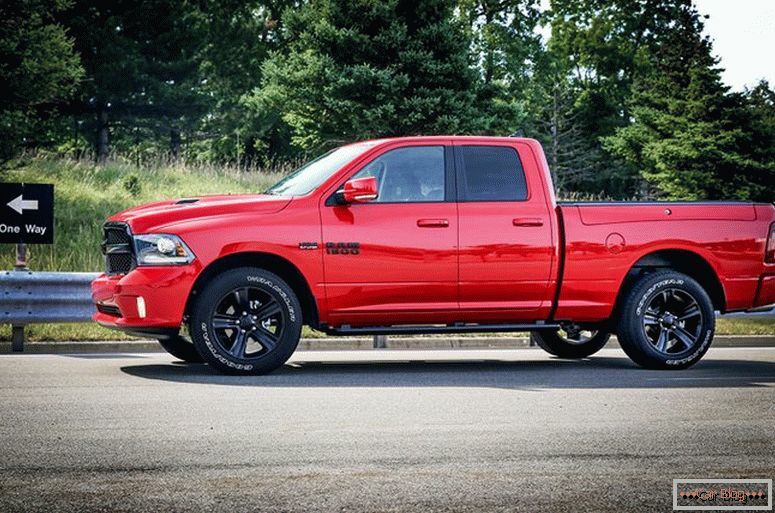 Who competes in the RAM 1500 market? Competitors are produced not only in other countries, but also in the USA. If in America there are not so many problems with competition, then Japanese cars are more dangerous (even in the domestic market). There are few serious rivals in Europe. Russian cars and Fiat do not believe the Romanian Renault, too. Remain perhaps that Volkswagen Amarok and Land Rover 110 Double Cab Pick Up. What are the chances of RAM 1500 in the Russian market? A Russian who buys a pickup truck differs from an American in that it is trying to find the most economical option. No matter how good RAM is, this is a black hole for gasoline, which, unfortunately, is not cheaper here. In service, such a machine is also not cheap. If you, for example, breaks the automatic transmission, it is easier to buy another car. Even worse, if you are a person with money, but you live far from major cities. On the periphery, with the details on such a car is traditionally tight. Domestic consumer takes the car, like UAZ Pickup, or Duster Oroch - cheap and angry. In extreme cases, ditch the "UAZ" is not as pitiful as the American car for more than 60 thousand dollars. Any RAM 1500 Rebel 2017, even at home, the car is not cheap. But let's think about who buys pickups and for what? Do they have free 4 - 4.5 million? Is not a fact. On credit is also not very convenient. On the sites you can often see ads for the sale of new cars from the Baltic States and other neighboring countries. But to pay a customs fee the size of the cost of an inexpensive car - wildness. And he can easily increase the price by $ 10,000. Ram 1500 will have chances only in the case of a miracle, like the beginning of assembly somewhere near St. Petersburg. But for now, one can only dream of such. Alcohol in the driver’s blood will be measured differently. 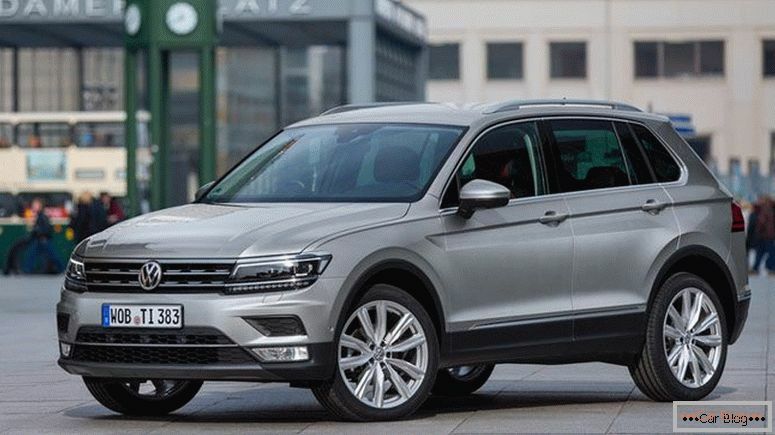 Cx 5 or tiguan, which is better to choose? Choosing the best car brand: audi or mercedes-benz?